David Williams was born on 18th October 1938 at the family home in Hereford. His father, a civil servant, went away to the war, and so he was brought up by his mother and his grandmother. Raised as a Baptist – a Calvinist - he spent a great deal of time in Wales, in Llandrindod Wells, where his grandmother lived (and his parents had lived), and where David still has a house today. Suffering from poor health as a child, he was made to drink the spa waters there. David’s grandmother always described him as having flaxen blonde hair, and cornflower blue eyes – a lock of his hair remains in her ‘Mazawatee’ tea tin to this day. He often spoke about the hard life and general poverty associated with war-time living, which meant eating a great deal of boiled onions and other vegetables and brown bread, and having very few toys, and no family car. He went to the village school in Tupsley, Hereford, and at the age of 9, being renowned for his lovely singing voice, he gained a scholarship to become a chorister at the renowned Hereford Cathedral school, a place that he described as ‘absolutely primitive’. When his father returned from the war, David was 8 years old, and the birth of his younger brother John, followed soon after in 1948. David remained at the Cathedral school and took ‘A’-Levels in the Classics - Ancient Greek, Latin and History, and went on to read for a Law Degree at Aberystwyth University – a place he chose partly because it was by the sea. David was no ordinary student – he enjoyed attending lectures for other subjects including economics, anthropology and geography – all of which interested him greatly. This love of knowledge and learning continued throughout his life. After University, David went on to train to become a solicitor in Hereford, followed by the College of Law in Guildford, and was admitted as a solicitor on the 1st March 1963. He travelled around for work - first in Milford Haven, and then in Manchester, spending a lot of time in London, where he mainly did property work. He later moved to Redditch, and then to Nottingham Trent River Authority (which later became Severn Trent Water Authority), where he met Shirley in the Playhouse Bar in the centre of Nottingham, on his birthday, in 1969. Shirley always said that David was very good looking but very shy, and had a lovely speaking voice. Shirley recollects one evening where they were at a dinner dance shortly after they met, where David brought his then girlfriend, but held hands with Shirley as well under the table! He even took his girlfriend home, only to return to the dinner dance in order to take Shirley home! However, after a false start, they eventually got married in Christ Church, Chilwell, Nottingham, on September 9th 1972, and lived in The Park, Nottingham and then in Chilwell. Their only child, their daughter, Kate, was born on the 8th March 1974, and they then moved to Solihull for David’s job as the Chief Property Officer in the Law Department at Severn Trent Water Authority on his birthday in October 1974. Shirley and David have lived in Solihull ever since, moving to Warwick Road, their current home, in November 1987, in order for Shirley’s father to come and live with them. David took early retirement in 1989, leaving the Water Authority due to being opposed to the privatisation of the water industry, and went on to work in local private practice, together with other organisations including St Basil’s, the homeless charity, the Citizen’s Advice Bureau and the Solicitor’s Regulation Authority. David received his certificate in 2013 from the Law Society in recognition of having been admitted as a solicitor for 50 years. David has always been very active in his spare time. 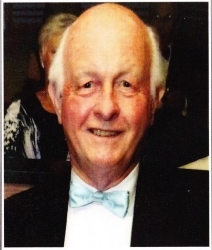 At one time he was the Chairman of the West Midlands Solicitor’s Group, a member of various clubs and was for years a Board member of Age Concern. David was an active member of Round Table, and his subsequent Masonry meant a great deal to him, where he made some very close friends, and enjoyed his time very much as the Chair of his mother Lodge, Fellowship, on three occasions, together with Jurisprudence and his Welsh lodge, Dowey Sant, where he was a founder member. As many of David’s friends and family will testify, he was anything but ordinary! – indeed, he used to describe himself with a twinkle in his eye as ‘exceptional’ – some would say, ‘eccentric’! There was no doubting his intellect and his general knowledge – Kate always said that ‘Dad will know’ – indeed she always went to him for his opinion and advice. He was an avid book reader, and indeed book collector – leaving Shirley with a veritable library all around the house! In fact, he collected many things, from Masonic medals and memorabilia, antique furniture and jewellery, to postcards and fridge magnets! Shirley has always complained that she has never chosen half of the furniture in the house (usually the white goods, as the furniture was either inherited or ‘discovered’ in an antique shop by David!) – and what’s more, he would never throw anything away! David was a lover of the finer things in life – travelling, together with food and wine – and he would ‘direct’ Shirley to make certain recipes that he fancied (it’s a good job Shirley loves cooking!). The house has always been full of cases of wine, and being a very sociable person, over the years, a great deal of entertaining has been enjoyed, with Kate commenting that her parents were ‘never knowingly under-catered’. David also loved music, particularly classical music and opera, and could himself play the piano; but he also appreciated modern music such as Elton John, The Beatles and Abba. He also loved to dance – Kate couldn’t believe her eyes when she saw him on a cruise in the nightclub with his hands in the air dancing to ‘Reach for the Stars’! David was renowned for his sense of humour. Some might have described him as sometimes rude or abrupt, perhaps initially seeming overly formal; but those who knew him soon realised that this was not the case. David liked to demonstrate his boyish sense of fun and, often tried to shock, by being controversial, seeking debate, or asking Kate’s friends overly personal questions or questioning Kate’s potential boyfriends for hours on the doorstep, as if they were on trial! In fact, David was not politically correct at all, and could be relied upon to cause a stir or make people giggle. Shirley used to say that she could not take him anywhere because of his flirtatious behaviour – she always knew, when they went out, no matter where, that he would flirt with somebody - with even a supermarket check-out lady telling him that he had ‘come to bed’ eyes! David often found it easier not to tell people he met that he was a solicitor. Instead, he would make up stories, such as being an actor, who played the back end of a donkey, or perhaps an executive chef. On one occasion this got David into trouble, when he told one man that he was an arms dealer, with the man believing him and asking him later if they could do a deal! David was a completely devoted husband to Shirley, and father to Kate; he loved his cats, and was very proud of his two grandchildren, Charlotte and William, who called him “Tadci”. He could be trusted to behave in a silly way, teaching them as babies to stick their tongues out and pretend to be a chicken/goose/banana or whatever caught his fancy. In fact Charlotte once said, “wiping bottoms is not Tadci’s thing. Being silly is Tadci’s thing”. David was deeply loved and adored by his family, and his friends. Indeed, David was always very popular, much loved by people of ALL ages, perhaps partly because of his huge sense of justice, duty and fairness, forgiveness and compassion. David always wanted to help where he could, and went out of his way to do so. Many a time, David could be found talking to people young and old and trying to help them. David was a person who understood; he did not judge, and indeed he cared very deeply about people, problems and society. He felt passionate about political matters, especially those to do with fairness and justice. His son-in-law, Geoff, has enjoyed many such conversations with him. Shirley and Kate have received a great number of lovely words from their friends about David – far too many to include here. But they have found it very comforting that the main themes that have come out of those words are the huge amount of respect and admiration that people had for David, and the high esteem in which he was held. Many have spoken of his kindness, and eagerness to help, together with his unique, and often very naughty, boyish, provocative and cheeky sense of humour. He has been described many times as “a one-off”. A dear old friend said that David had helped him many times. He said, “sometimes I took his advice, and sometimes I didn’t. When I didn’t take it, it was the wrong decision”. Another friend recently described David as “a gentle gentleman, with a twinkle in his eye and a great sense of humour”.